This is a waterfall of extremes. With a high volume of water, it drops almost vertically into a huge, neat pool surrounded by massive rock bluffs, which can be quite scenic and photogenic in the right conditions. However, the water is often dirty and there is tons of trash, tangled fishing line, and brown foam floating in it. And despite the trash, the pool also is extremely popular for swimming and the rocks for sunbathing, making it even more of a challenge to enjoy in its natural condition. Tragically, this waterfall accounts for a good portion of the waterfall accidents in the region, too. While the currents alone can be strong enough to cause problems for people swimming in the pool, the bigger risk seems to be from people jumping from the rock face beside the falls into the pool. Some never resurface. Deaths here are far too common (most recently in June 2007 May 2010 August 2015 July 2016 May 2018). It's best to just stay completely out of this river given its propensity to consume people and garbage. Local Sheriff's are calling for the Federal Government (Forest Service) to "do something" to stop people from taking the risk of jumping, but signs and warnings haven't helped. Likely the only "solution" would be closing the area around the falls completely. Elk Falls is very near the Tennessee state line. There are more waterfalls on the Elk River in Tennessee not far downstream (Twisting Falls). Also in the area, Jones Falls is a on a much smaller stream a very short distance northwest into Tennessee as well. 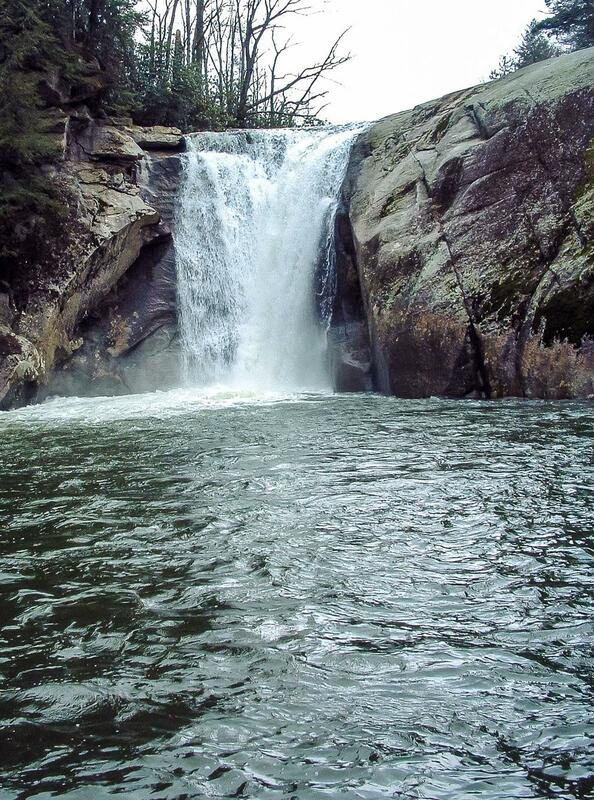 Together, these falls attract more reckless jumpers and swimmers than most others in the region. If you are in the Elk Park area along US Hwy. 19E, do stop by for a look, but expect less than ideal natural conditions and feel lucky if you're not bothered by any trash or crowds.